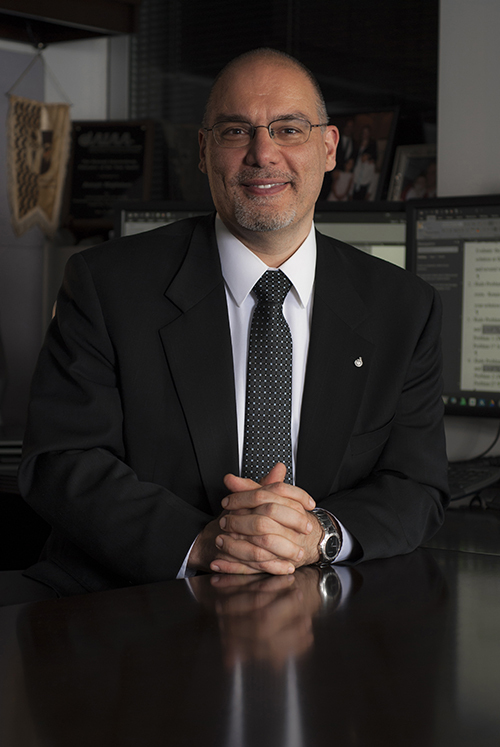 Joe Majdalani, Francis Chair of Excellence in the Department Aerospace Engineering, received the American Institute of Aeronautics and Astronautics Solid Rockets Best Paper award recently at the Propulsion and Energy World Forum in Salt Lake City. His paper, “Improved Mean Flow Solution for Solid Rocket Motors with a Naturally Developing Swirling Motion,” describes a breakthrough in modeling the internal ballistics in solid rocket motors, explaining how swirl can suddenly develop along the axis of a cylindrical rocket grain. This scholarly recognition marks the sixth national accolade that Majdalani has received from AIAA, with four being awarded in the past three years while serving at Auburn. Majdalani has also co-authored 11 SEC Region II best papers in the past six years. In addition to Majdalani’s sequence of national recognitions, two of his other papers authored with Orie Cecil and Tharikaa Ramesh Kumar, graduate students in aerospace engineering, were selected as best of their sessions and nominated for awards in the hybrid and solid rockets disciplines. Majdalani was also elected chair of the AIAA Solid Rockets Technical Committee and editor of the next AIAA solid rockets textbook.